IT organizations require a methodology for replicating and recovering workloads from a primary site to a recovery site in an event of a disaster or an un-planned outage. To facilitate and automate this recovery process of workloads VMware has products such as Site Recovery Manager (SRM) and vSphere Replication that can automate and orchestrate the recovery process during a failure from a primary site to a recovery site. Today, SRM recovers replicated virtual machines from a primary to a secondary data center. SRM can perform network mapping (and re-mapping) between the primary and secondary locations so that recovered virtual machines can be re-connected to the appropriate network. These networks can be a VLAN-backed Distributed Virtual Port Group (dvPG) or a NSX Logical Switch. NSX and network virtualization enhance the Disaster Recovery solution by preserving L2 and recovering the entire logical network topology at the recovery site. NSX also adds API based automation at the networking layer to further improve Recovery Point Objective (RPO) and Recovery Time Objective (RTO) goals. 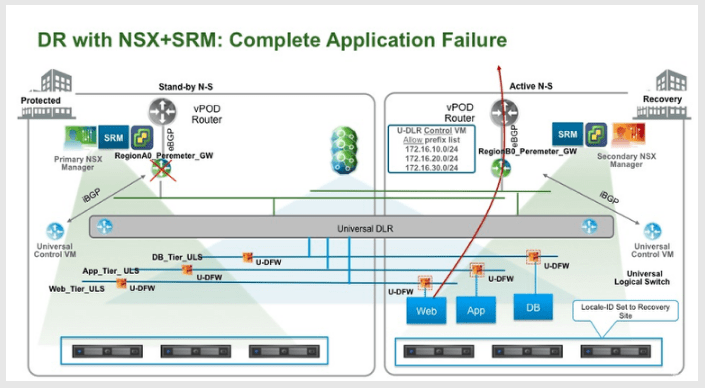 Combining NSX with a SRM based DR design dramatically simplifies the recovery of vital networking services in the secondary location including Logical Switches, Distributed Logical Routers and Distributed Firewall (DFW) Rules. This lab will describe the process of recovering workloads backed by NSX virtual networks. NSX supports seamless spanning of network and security policies across multiple sites through the use of the Cross-VC NSX feature introduced in NSX 6.2. The DR solution can also be built without leveraging Cross-VC NSX by using an external replication/synchronization mechanism (such as vRO) to recreate Logical Networks and Security between separate NSX instances across the two sites. However, cross vCenter NSX greatly simplifies the process. Deployment elements consist of Universal Logical Switches, Universal Distributed Logical Router and Universal Distributed Firewalls. These universal objects facilitate the creation of a single unified logical network (L2, L3, DFW) across protected and recovery sites. The application can failover and recover seamlessly without the need for manually re-creating the network on the recovery site or manually mapping/re-mapping IP addresses. Intrinsic Security with NSX-T 2.4 – How it works?